Pre-registration Required. Please register by March15th. "Economic Outlook 2019 - Should you fear the recession?" Professor Duy received his B.A. in Economics in 1991 from the University of Puget Sound, and his M.S. and Ph.D. in Economics in 1998 from the University of Oregon. Following graduate school, Tim worked in Washington, D.C. for the United States Department of Treasury as an economist in the International Affairs division and later with the G7 Group, a political and economic consultancy for clients in the financial industry. In the latter position, he was responsible for monitoring the activities of the Federal Reserve and currency markets. Tim returned to the University of Oregon in 2002. 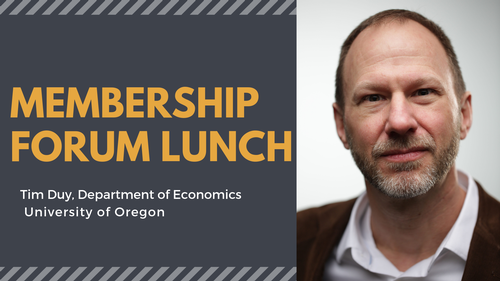 He is the Senior Director of the Oregon Economic Forum and the author of the University of Oregon Statewide Economic Indicators, Regional Economic Indicators, and the Central Oregon Business Index. Tim has published in the Journal of Economics and Business and is currently a member of the Oregon Governor's Council of Economic Advisors and the State Debt Policy Advisory Commission. Tim is a prominent commentator on the Federal Reserve. MarketWatch describes his blog as ?influential,? the Huffington Post identified him has one of the top 26 economists to follow on Twitter, and he is listed on StreetEye as one of the top 100 people to follow to discover finance news on Twitter. Major national and international news outlets frequently quote him, including the New York Times, the Washington Post, the Financial Times, the Wall Street Journal, and Bloomberg. He also writes a regular column for Bloomberg Opinion.